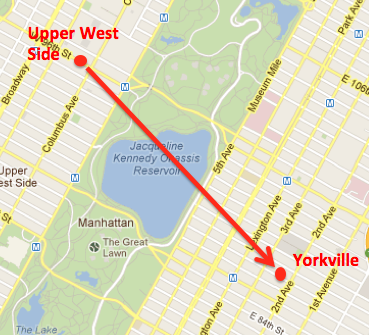 I lived on the Upper West Side for three years -- from 2008 to 2011. I had a couple of different roommates, and we shared a pretty big two-bedroom on 96th Street just west of Columbus Avenue. When my landlord told us last summer that he'd be increasing our rent by almost 25 percent in the fall, I decided to move out, and look for a place with my girlfriend. We knew that the only neighborhoods we could afford in Manhattan were north of 125th street or Yorkville. (I would say the Upper West Side is pretty much unaffordable for young people like me who are journalists, not bankers). 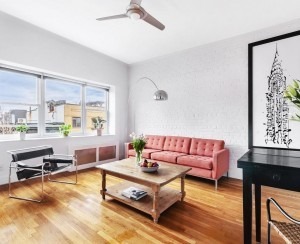 We briefly considered Astoria and Williamsburg (which was no less expensive than Manhattan), but ultimately decided that now -- when we're still in our 20s and don't have kids or anything -- we'd take advantage of any opportunity to live in Manhattan. I doubt it'll be too long before we're priced out altogether. We both preferred the Upper East Side to Harlem, Queens and Brooklyn because of the proximity to the 4 and 5 express trains. We also thought the neighborhood felt a bit younger. 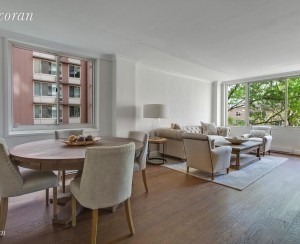 We chose a small, one-bedroom apartment in a walk-up building on East 88th Street between Second and Third Avenues, for under $2,000 a month. On the Upper West Side I lived in fifth-floor walk-up, and here I do too, so that was nothing new. I don't mind it and I like the exercise. Sure, I'd like certain conveniences -- like laundry and an elevator, but if you want to live in Manhattan and you're not rich, you have to give some things up. We have just about every store we could need within a five-to-10 block radius -- from clothing stores to pharmacies to book stores to supermarkets. On the Upper West Side, I really liked the proximity to the parks, the convenience of the subways -- the 1, 2, 3, B and C. The M96 bus, which travels across 96th Street from East to West and vice versa, was suprisingly quick, and now that I've started riding the incredibly slow M86 across 86th Street, I appreciate that even more. When I first came to the Upper West Side, I liked the fact that it felt a little bit more suburban and quieter than other places in Manhattan. And it was a nice change after living south of 14th Street while I was at NYU. But I never really felt like I fit on the West Side, because I lived when I was 23-26, I don't have a family or a dog. Also, although I'm Jewish, I'm not as religious as people there -- and the Jewish world felt clique-y. The people in my building now are younger, and more closely aligned to where I am in life. The only downside to that is that sometimes it feels a little bit frat-like and overly preppy. We regularly discover new restaurants we really like in Yorkville, like a Mexican place called Pepe Petron, and an Italian place on 92nd Street called Delizia 92. I have to say also that being around the corner from Shake Shack (on 86th Street between Lexington and Third) is a pretty nice perk. A big negative is the proximity to the Second Avenue subway construction -- it's not a great feeling to have to wind your way past all that stuff. There's just constant drilling. On the other hand, I think we got a better deal, even for being a small walk-up because we're so close to all of that construction. The best deals we found overall were just off First, York, and East End, but we didn't want to be that far from the subway. I pushed for west of Second Avenue. But I have no doubt that once subway is constructed I won't be able to afford to live here anymore.